We’re mid-way through our second year at the New England Boat Show, and having a great time introducing boaters and marina owners from all along the eastern seaboard to Dockwa. We were also thrilled to win Best in Show for displays under 200 square feet! The New England Boat Show showcases a range of boats for cruising, sailing and fishing, as well as more than 250 exhibits of the latest navigational equipment, hardware and galleyware, and other marine accessories. Here are a few of our favorites. 1. This was the first we’d seen of Inflatable Boat Racing, and we're definitely intrigued. While the sport has been around for more than twenty years, it only more recently spread to other countries from South Africa. See what all the fuss is about at booth 2028. 2. Both the Boston Sailing Center (booth 421) and Courageous Sailing (booth 1327) are homes to members of the Dockwa team. Stop by to talk with their staff about how you can get your start on the water this spring with lessons, private instruction, and membership. 3. We have one team member in particular who is a fan of any dog-friendly boating gear. If you plan on bringing your pup with you out on the water this season, Our Good Dog Spot at booth 1016 is right up your alley. 4. 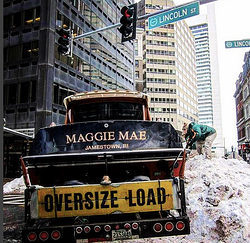 Hinckley Yachts made headlines last year with Maggie Mae’s grand entrance on Summer Street. This year we enjoyed exploring the models this prestigious yacht builder brought to Boston – see for yourself at booth 1816. 5. 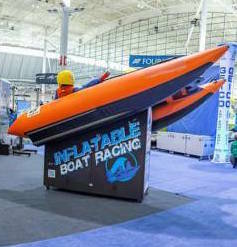 Progressive Insurance brought a new level of indoor boating fun to the show with interactive demonstrations and games. Stop by booths 1300 and 1600 to flex your fishing muscles and practice docking! 6. BoatUS, a Dockwa partner, provides boaters everywhere with insurance, 24-hour dispatch coverage, and a wealth of knowledge. Stop by booth 3408 to talk shop with their team and make sure your boat is covered for summer. 7. We may be biased, but some of the best booths at the boat show belong to the forward-thinking marinas and yacht clubs that use Dockwa to manage reservations – which leaves them more time to make their marinas the best they can be. If you’re in the market for a yacht club, shipyard, or new boating destination, stop by one of the booths listed below. The boat show wraps up this Sunday, February 21 at 5:30pm, so get your tickets ($15, and kids under 15 get in free!) and make your way to the BCEC in Boston’s hopping Seaport District. Check out the seminars, clinics and contests, and stop by booth 161 to meet the Dockwa team and enter our Yeti cooler giveaway!